A WOMAN'S ultimatum to her boyfriend: "it's me or the dog" has backfired, hilariously. 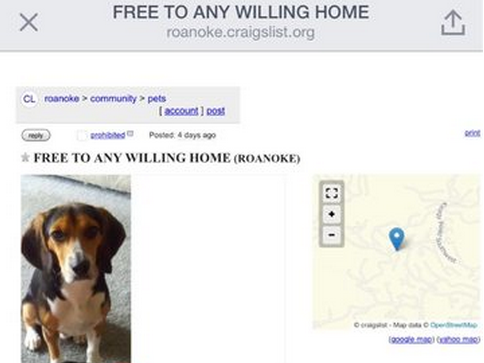 This ad, posted by the boyfriend - an unnamed gent from Roanoke, Virginia - was posted on Craigslist and shared on Imgur and Reddit. "My girlfriend does not like my beagle Molly, so I have to re-home her. "She is a purebred from a wealthy area and I have had her four years." "She likes to play games. Not totally trained. "Has long hair so she's a little high maintenance, especially the nails, but she loves having them done. "Stays up all night yapping but sleeps while I work. "Only eats the best, most expensive food. Will NEVER greet you at the door after a long day or give you unconditional love when you're down. Does not bite but she can be mean as hell!" >> Is this the world's most adorable missing cat poster? "So... Anyone interested in my 30 year old, selfish, wicked, gold-digging girlfriend? Come and get her! "Me and my dog want her re-homed ASAP!!" "Sorry but she has been re-homed her original breeders (her parents) have taken her back home. "Molly and I are looking for a new one."